Q: I'm interested in learning more about scrapbooking. Do you have any ideas to get me started? A: Absolutely! Since May is National Scrapbooking Month, this is the perfect time to give the popular and rewarding hobby of scrapbooking a try. Starting anything new can be intimidating, especially when it involves something as important as your special memories. I've got some great suggestions to get you started. There's no better time than now to pull those photos out of the boxes or computer files where they're being ignored. Just imagine the joy you'll feel when you can open your scrapbook to enjoy and relive some of your cherished moments. Starting small is a great way to test out the world of scrapbooking. Just like when you first begin cooking, it makes sense to start learning with a simple recipe instead of a five course meal. Begin by selecting a theme for your album. It could be five photos of your mother that you'll use for a Mother's Day gift, a dozen photos of your favorite flowers from your garden, or a handful of photos from your favorite vacation. You pick whatever theme excites you! Mini albums can be created in a variety of styles and sizes that range from whimsical to formal. Create a mini album from a few card stock tags held together with a binder ring, a 6" x 12" piece of card stock folded like an accordion, a stack of standard card bodies punched with the Crop-a-Dile (#108362) and bound together with ribbon, or from our 5" x 5" Art Journal (#108495). Add your photos, layers of Designer Series Paper, stamped images, and punched accents that coordinate with your theme. Don't forget to add journaling as that is an essential element to any scrapbook. Journaling can be simple date and name information or more detailed expressions of thoughts and feelings that your photos represent. Designed with coordinating Textured 12" x 12" card stock, Designer Series Paper, and self-adhesive die cuts, the Simply Scrappin' Kits help take the guesswork out of creating beautiful scrapbooks. They can be used for traditional 12" x 12" albums, 8-1/2" x 11" albums, 6" x 6" albums, or any variety of mini albums. 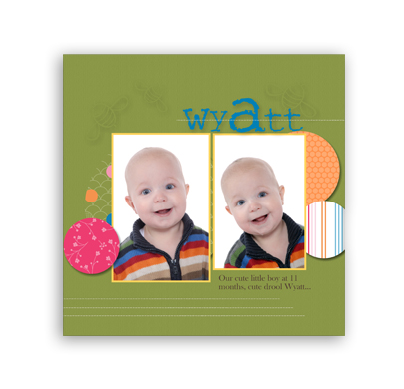 Consider creating a 6" x 6" album that focuses on one or two special moments from each month of the year. Begin with the One Great Year Simply Scrappin' Kit (#118705) that features a calendar-like theme, including self-adhesive die cuts for labeling each month. Start by cutting the 12" x 12" Textured card stock into quarters, giving you four - 6" x 6" pages from each sheet of card stock. You could create a single page for each month (twelve - 6" x 6" pages) or a two-page layout for each month (twenty-four - 6" x 6" pages). Cut a 2" x 6" strip of the included Designer Series Paper for each page. 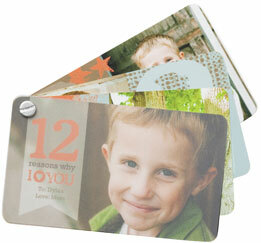 Add a 4" x 6" photo to each page, or one photo for each month's two-page layout and leave the other page for journaling. Or crop your photos to fit more than one on the page. Add the self-adhesive die cut for each month and any die-cut strips or other die-cut accents you like. If you want to step up the design a bit, add some coordinating stamped images such as the Calendar (#109298) background stamp for journaling events during the month. To step up the design even more, add punched shapes and ribbon. Slide the completed pages into any of the 6" x 6" albums from page 180 of the Idea Book & Catalog and you have a "year in review" album that you can treasure and share anytime! You may discover that the Simply Scrappin' Kit makes creating the album so simple that you'll want to make one as a gift for grandparents, too! Digital crafting is a fast-growing trend in the world of scrapbooking. With the popularity of digital cameras, many of us have begun taking more photos than ever because we don't have the expense of developing them all. The unfortunate side effect is that many of those photos never go beyond their lonely home in some computer file! Our digital crafting software called My Digital Studio is a great solution for getting those forgotten photos into albums. With My Digital Studio, you can print individual 12" x 12" or 8-1/2" x 11" pages as well as bound photo books in a variety of sizes and styles. You can create custom themes with stamp images, Designer Series Paper, embellishments, and more. Or you can create an album - literally in moments - by using the wonderful artist-designed templates included in My Digital Studio and the auto-fill option that magically plops your photos right into the template. Add a bit of journaling to each page, crop photos and fix red-eye if you wish, and you can be done. Or take the template and customize it a bit by adding or removing elements of the designs, photos, rearranging pages, or whatever you want. It's all customizable, even when you start with one of the pre-designed templates. With over 3000 exclusive stamp images and papers, you'll have all kinds of ways to customize and create your scrapbook. Even more stamp sets (called stamp brush sets in the digital world), Designer Series Papers, embellishments, punches, and templates are available for purchase and immediate download at shockingly low prices! Digital scrapbooking is perfect for people that love their computers, don't have a lot of space for traditional scrapbooking, with lots of digital photos that aren't printed, and those that want to be able to share their scrapbooks by email or on photo-sharing sites or want to easily print multiple albums to give as gifts. I have to let you know that, in addition to scrapbook pages and photo books, you can create calendars, cards, journals, DVD-videos, movies, and multimedia projects with My Digital Studio! So you'll have oodles of options for expressing your creativity and sharing your special photos. During May only, Stampin' Up! is celebrating National Scrapbooking Month with discounts of 30% off select scrapbooking-related stamp sets and My Digital Studio downloads. A variety of My Digital Studio professional print products are also 30% off. So there's no time like the present to dive into the world of scrapbooking. I think you'll love experiencing the joy of truly being able to view, enjoy, and share your special memories that defines the art of scrapbooking. Contact me today for more information about scrapbooking or the special National Scrapbooking Month promotion so you can take advantage of the discounts only available this May! Have a Question? Contact me or leave it in the comments section below. To order any of the items listed above, please visit my Online Store.